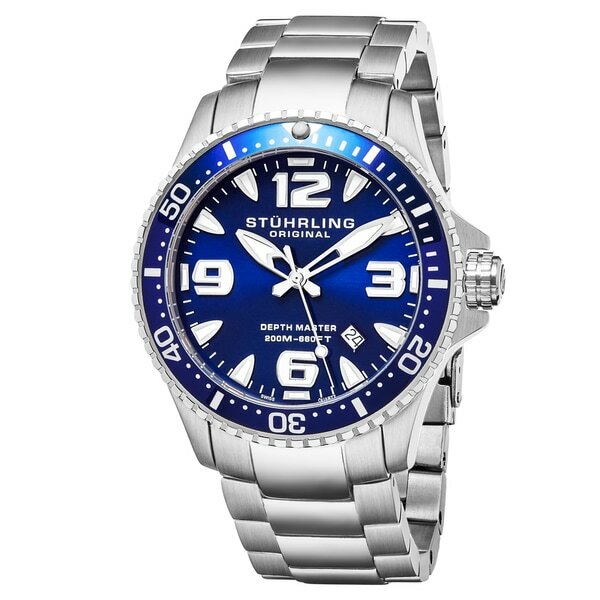 My recent purchase of the Stuhrling watch was a wonderful purchase. The watch arrived in 3 day's and was even better looking then the pictures showed. A very manly watch and looks great on my wrist. I have had it less then s week and have had 3 different people give me complamenuts on the watch. It's is a great watch and I am very happy with my purchase. Bought this watch for my husband. I knew I was taking a chance as he is picky. He loves it !!! It looks even better than pictured. It is very easy to read and love the illuminated hands. The blue face stands out and makes it easy to read. Very nice weight also. I would buy again. Very happy with this purchase.